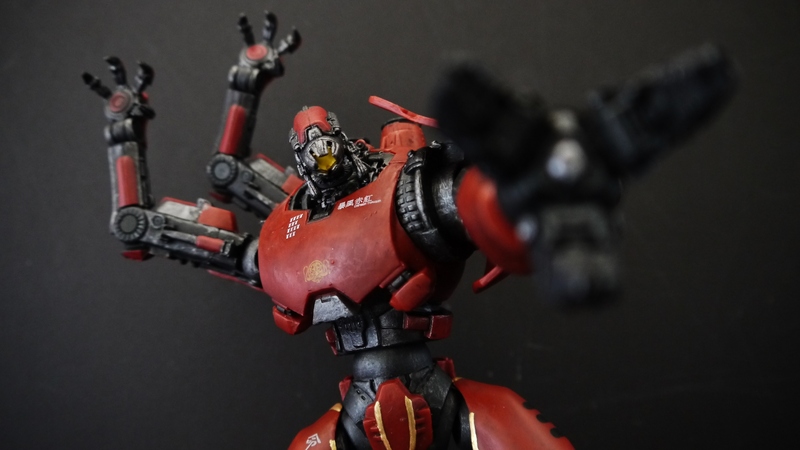 There’s already enough controversy over this Jaeger’s [lack of] performance in Pacific Rim, so I won’t go much more into it than that. 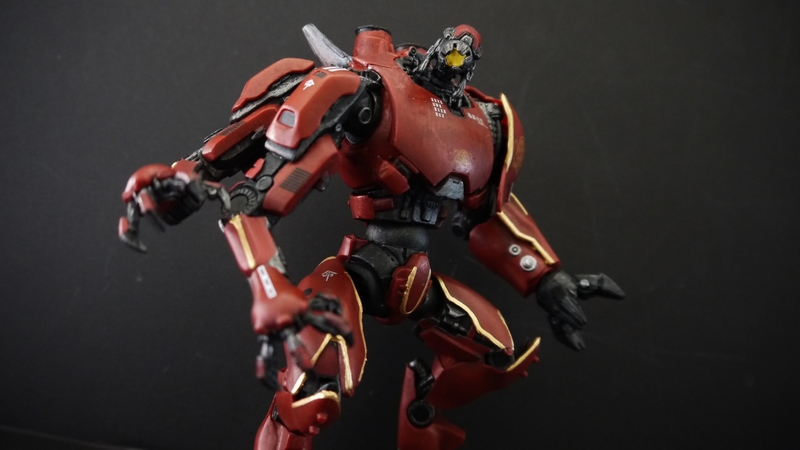 All you need to know is that it’s one of the greatest, and its figure release was part of NECA’s series 1 lineup, along with Gipsy Danger and Knifehead. 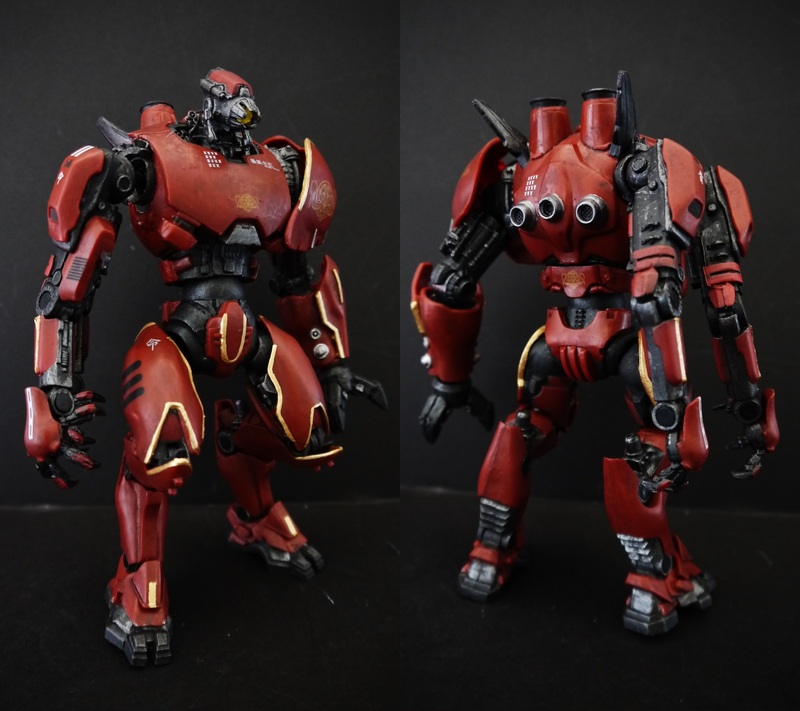 Crimson is a rather unique Jaeger in terms of design, with digit-grade legs and the classic mecha mono-eye. The paint-job is fairly nice; the usual gunmetal feel to the joints and metal innards is there, with a dry-brushed silver/steel look, though unfortunately the red armor isn’t as shiny or crimson as it is on-screen. 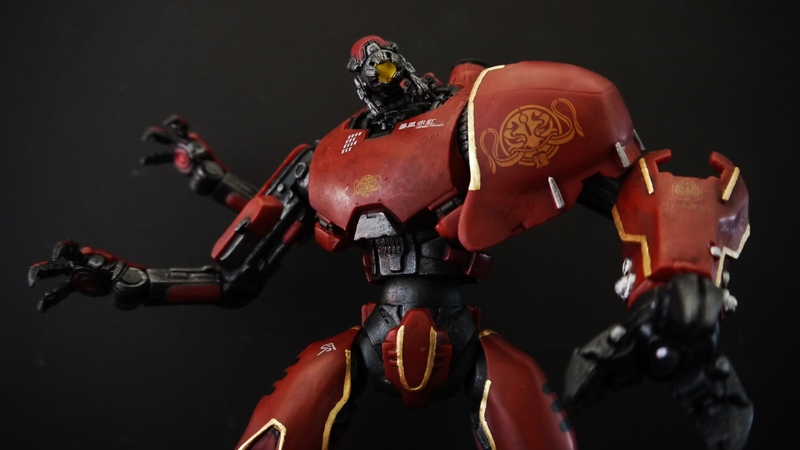 The decals and little text details on this Jaeger are also pretty well done; the signature Crimson Typhoon mark on the shoulder is nice and crisp, as are the rest. And naturally, I’ve made some custom modifications to my personal Typhoon in the form of some small paint refinements. Most notable is the much brighter gold for the borders of the mech. They were originally a faded piss-gold (same color as the decals) but I wanted to add a little more bling. Therefore shiny makes everything better. Some gunmetal paint was also added to select mechanical parts, such as the Plasma Caster on the single left arm. Just to break up the monotonous black that it was. In addition, the thing that peeved me the most with this figure at first was the head sculpt. More accurately the paint job on the mono-eye. The figure’s original out-of-box condition had the mono-eye and surrounding “prongs” that cover it painted yellow on the inside. While some could argue that this gave the illusion of “light spill” from the eye, it just looked like plain lame paint production on NECA’s part. You couldn’t distinguish the yellow of the actual eye from the case around it. Therefore I simply added some gunmetal paint to the inside of the prongs and problem fixed. I personally think it looks world’s better now, and that single flaw almost set me off from opening this figure at all. It’s not just a one-off production error either; it’s standard throughout all Crimson figures. This figure overall still does feature a nice sculpt. The little details look great, especially with that dry-brushed silver finish. A good contrast between the wide surface area of the armor and the intrinsic detail of the mechanical works. 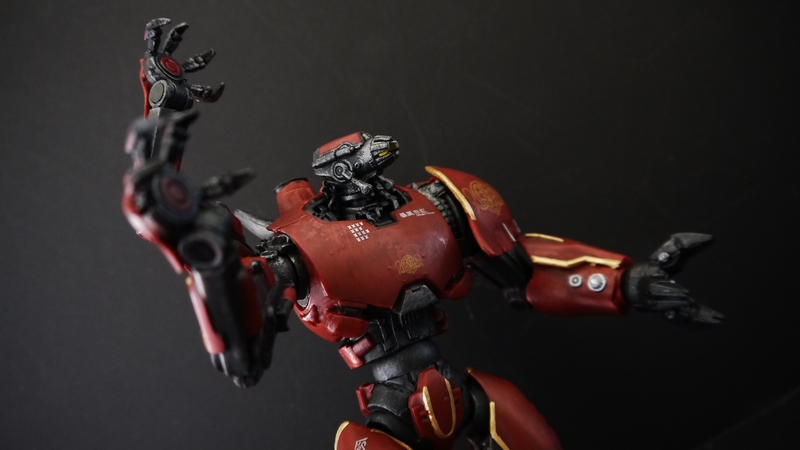 Being that this particular Jaeger has…well, three arms, you can expect some more posing possibilities and playability given the extra appendage and therefore extra articulation. Sadly, a production error seems to have nerfed this hope for many a collector in the form of one of the right arms. 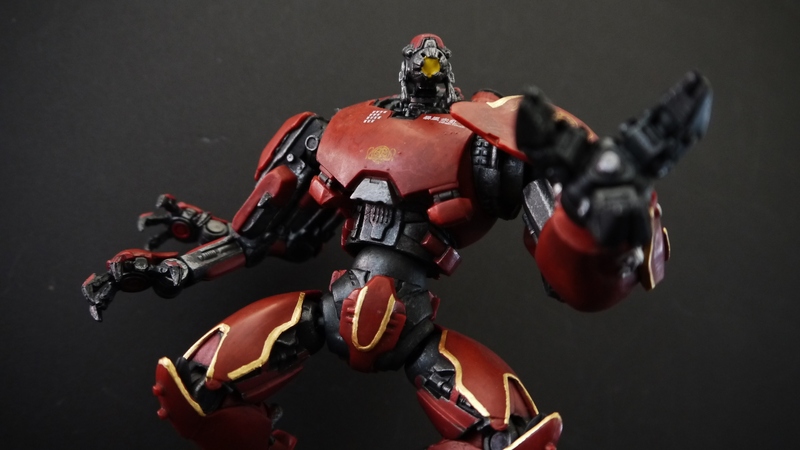 From what I can tell, both right arms are supposed to be on two ball joints – the joint itself is dumbbell-shaped, with one ball plugging into the body and the other plugging into the actual arm socket, allowing for some pretty good movement. Unfortunate as it is, for the frontal right arm, the ball that goes into the torso is actually glued in place and stuck deep into the torso; only the joint that plugs into the arm socket itself is moveable. This means the arm really doesn’t get much more movement than simple swivels forwards and backwards, and very limited outward range. Thankfully though, after popping the arm off, I went ahead and used some pliers to remove the joint from inside the body cavity. It isn’t exactly strongly glued in place, so removal shouldn’t be difficult at all. Upon doing so, I simply moved the joint a little more outwards and glued it – this time for sure – closer to the exterior of the torso, giving the outer ball joint more range. The frontal right arm is now still on a single joint, but is capable of a much rider range of motion, given that it has an entire ball to move around on. The only trade-off is that you lose the seamless joint detail which it had originally (you couldn’t see the joint, given it was hidden deep within the torso). The added arm articulation is really what makes this figure though. I’d recommend the fix to anyone who picks this up; you never really notice how restricted it was until you see what it’s really capable of. Wrists are simple hinge joints; wish some hand-saws would’ve been included, but what can you do. Elbows can only really go ninety degrees. Most of these Pacific Rim figures thus far have the bare minimum of figure articulation; just enough to prevent being relegated as statues. My biggest gripe with this figure lies in the ankles though. Or lack of. The ankle joints are simple backwards and forward hinges, no [logical] ball joints. Why this is, I have no idea. I don’t see any valid reason not to add ball joints to Crimson’s ankles. With this, there’s no way to have it stand flat on the ground unless the legs are perpendicular to the ground. Wide, dynamic stances therefore look funky. I’ll also add right now that I’m particularly fond of the large arm-cannon-claw-hand. To be honest I never even realized Crimson had this in the film, given the triplets didn’t make use of it. It’s actually attached via ball joint so it can rotate and spin a bit. Claws don’t articulate though. 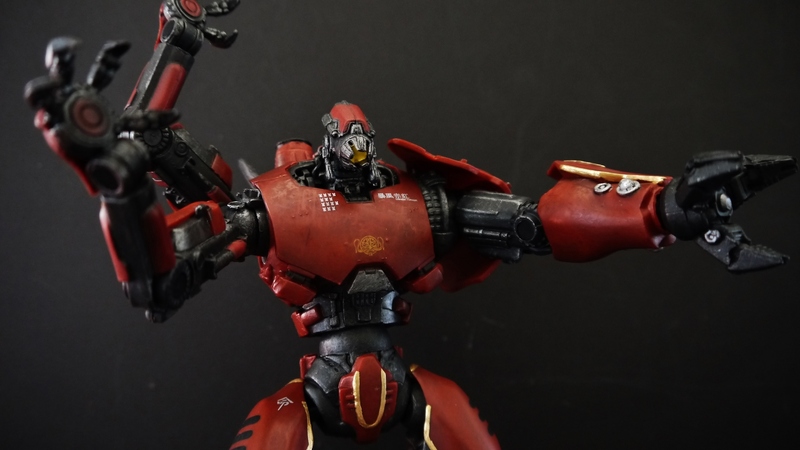 Like most of the other Pacific Rim figures released by NECA (up to Series 2 anyway; Series 3 seems to be more promising) Crimson seems to boast screen-accuracy and sculpt detail in favor of articulation or playability. This is in no way a bad figure though; I think it could be considered the pinnacle of Series 1, though still outshone by Series 2’s slightly more advanced Striker Eureka. 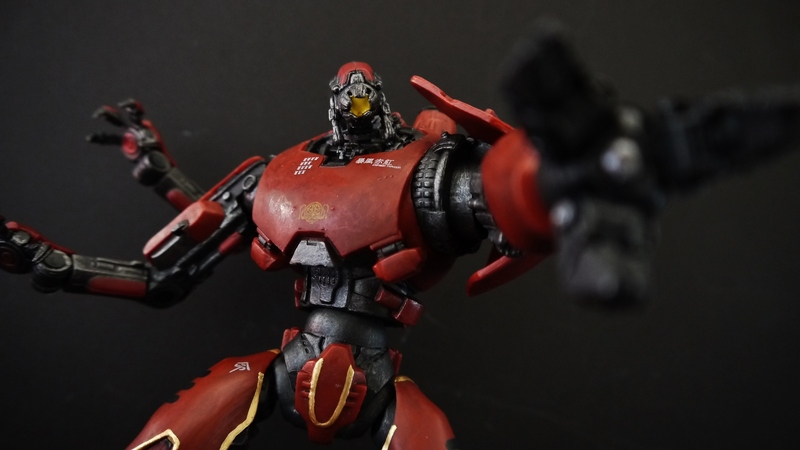 Definitely worth a buy if you’re a Pacific Rim fan, though by now these figures are few and far in between, and often cost much higher than their original $18.99 tag price. The repaint looks awesome. I would love to repaint mine but I have no clue of what kind of paint works best. I kind of hate the dull brick red and the sloppy paint job on the mono eye. Can you tell me what kind of paint you used to repaint your crimson typhoon? Thanks, glad you like it! The changes I made are subtle but I think they work. 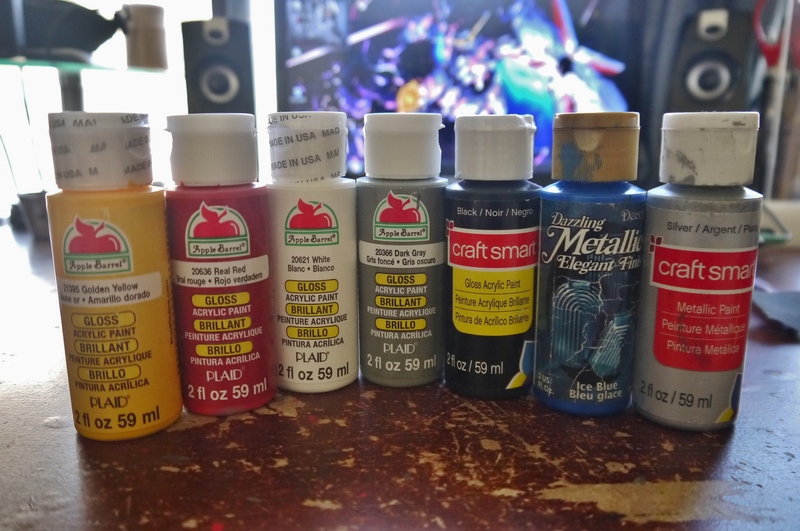 🙂 I used small craft acrylic paints, the kind you can find at craft stores like JoAnn’s or Michael’s.